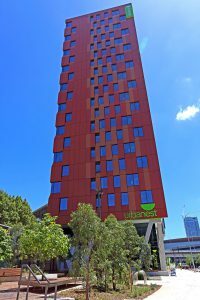 Stockholm – March 28, 2017 – Urbanest Darling Square (Urbanest), an intelligently designed student accommodation complex located in Sydney, Australia, has enhanced security and convenience by installing ASSA ABLOY Hospitality’s Visionline wireless online solution alongside its VingCard Signature RFID door locks, equipped with mobile access compatibility. The locking solutions will work in tandem with ASSA ABLOY Hospitality’s mobile app to create convenient mobile access for Urbanest’s residents. ASSA ABLOY Hospitality’s Mobile Access operates with secure Seos technology, creating innovative security solutions by collaborating with property management systems to assign digital keys to each room and securely deliver them to residents’ smartphones. The technology generates an encrypted digital key within the ASSA ABLOY Hospitality app that pairs with a resident’s smartphone, giving them exclusive mobile access to their room or suite. Once a resident swipes their phone, the app transmits the encrypted key using the device’s Bluetooth capability, ensuring total room access security and convenience. Through implementation of the VingCard Signature RFID door locks, facility leadership additionally gains enhanced security functionality due to the platform’s use of cutting-edge anti-cloning technology. With Visionline, personnel are also able to remotely monitor which keycards have accessed a particular area of the property and when. Any cards suspected of unauthorized use can consequently be deactivated remotely in order to minimize any threat to resident safety. The current installation is the first stage of this project for Urbanest, with stage two commencing later this year. The property currently offers 635 rooms for students and is centrally located near Darling Harbour. It is within walking distance from UTS, the University of Notre Dame, the University of Sydney, public transportation and multiple shopping centres.